On working on jazz band Flanuer Daguerre’s album artwork for “Big Big Intersecting Clusters”, I decided to experiment with an old photography printing technique I had never tried before – the cyanotype process, which in a nutshell involves using cyanide, a paintbrush and the power of the sun to contact print photographs. As you can imagine it’s not a technique you can exert too much control over nor one to take lightly given the deadly poison involved. 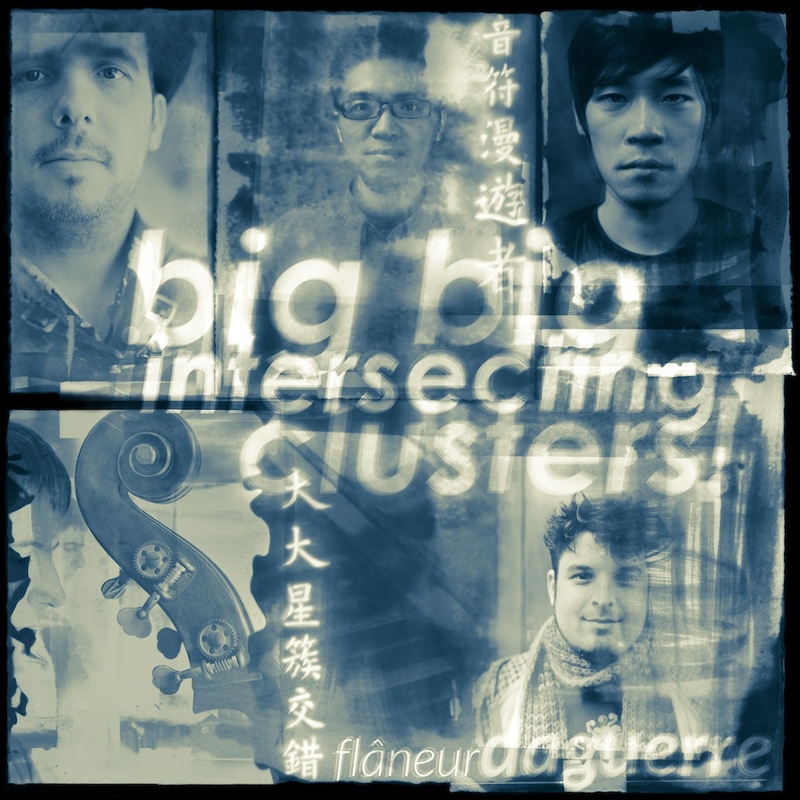 Inspiration for the artwork came from the jazz collective’s name and their musical philosophy, which are related to the thinking of intellectual Walter Benjamin. A “flaneur” is a people watcher and subject of Walter Benjamin’s “Arcade Project”, while, Louis “Daguerre” is the inventor of one of the first ever photography printing methods devised, the daguerreotype. “many of those to use the daguerrotype method suffered severe health problems or even death from mercury poisoning”, so I decided to play it safe and stick with cyanide. In keeping with the classic photographic procedures being employed, I shot the album images with a wooden view camera, a type of camera first developed in the era of the daguerrotype. Nevertheless, this is not the 1840’s any more and the final presentation of my work will inescapably be a digitally printed CD sleeve. Correspondingly, the album being produced is a digitally recorded and mastered ‘image’ and not something unrepeatable and organic like a live jam session. I heard something recently that made me think about this (layered over a surprisingly chilled mix by drum ‘n bass DJ Blu Mar Ten I was listening to at the time ). Modern recording techniques are now so good that they have breathed new life into acoustic instruments (they had been so hard to record that electronic instruments were developed for the purpose). It could also be said that scanning and computer programmes like Photoshop can now offer something new to old processes like cyanotypes. 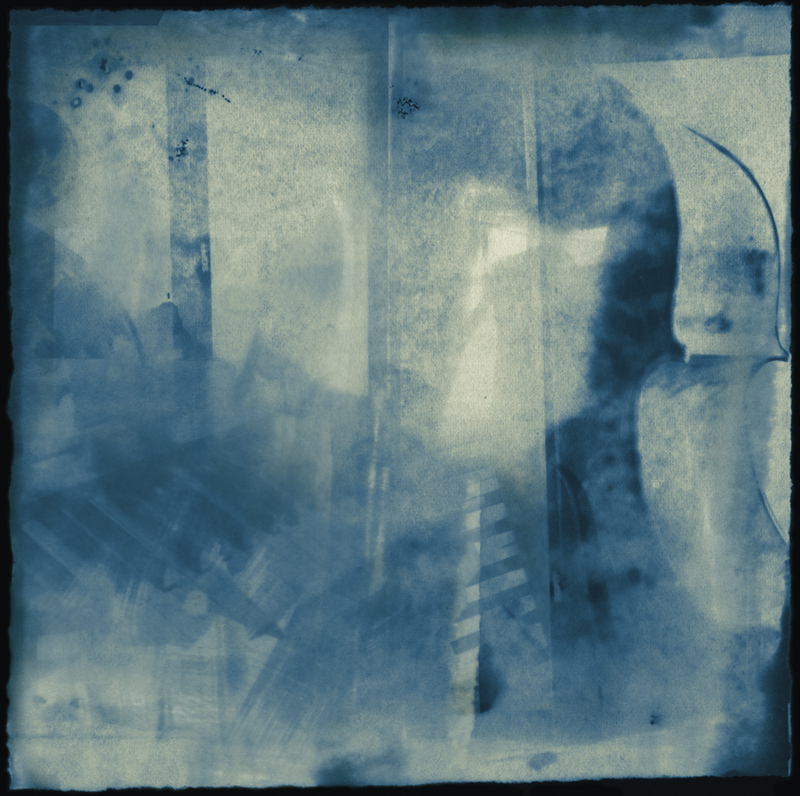 Hence, the final album images are not straight forward chemical prints but scanned cyanotype chemical prints made from the the original black and white negatives – which are then repeated and blended and combined with direct digital scans of the same negatives. For the inlay strip recipe I even sprinkled a few images of the band made previously via digital camera, completing the marriage of old and new.